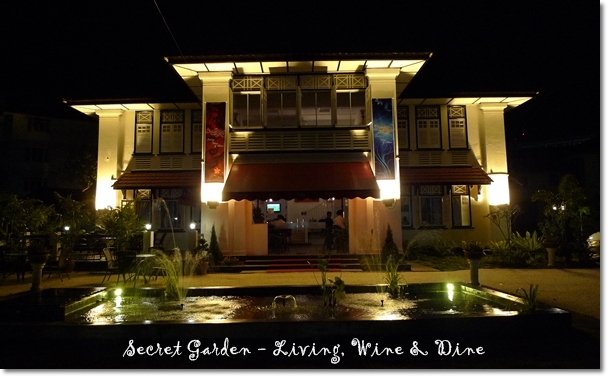 Secret Garden Bistro – The open air dining concept (al fresco) taken to different heights; Sipping on your wine while being caressed by the soothing splatters of water from the fountain, and hopefully …. some lush greenery in the near future. I would be lying if I say I am not intrigued by the sheer pleasure of introducing yet another new eatery in Ipoh, although this one being relatively new. The official launch of Secret Garden was sometime during the first week of August 2010. The bistro started operating way back in June or July, but the boutique hotel on the first floor (only three premium rooms, as far as I know) designed to exude a certain heritage aura will only be opened for reservations in the near future. The rustic charm in the carefully executed planning and designing of the facade and interior of Secret Garden deserves a mention; especially those supposedly-REAL barrels used to prop up a glass table top at the bar area. Many are still kept in the dark about the exact location of Secret Garden, or what type of cuisine one can expect to indulge themselves in. Heck, even if you zoom by this lane leading to Secret Garden, all lined with a tall foliage of trees, you might just miss the place as there is NO huge signboard lighted up with neon spotlights, nor engraved walls/tiles with the company’s name emblazoned on them. The landscape fronting the lawns of Secret Garden may take some effort to appreciate though ; given the rather barren lands currently utilized as a free-for-all parking lot. Greek Salad (RM20.90/USD6.30) – Tossing black olives, tomatoes, crisp cucumber, sliced red onion, green capsicum and feta cheese. Pardon the grainy shots, for the ambience was really dark and cozy; merely lighted up with soft lighting from the elegant lamps looming over the tables. Started off with a zesty rendition of Greek salad, combining various fresh greens tossed lightly with a piquant dressing. The serving plate used to present this appetizer was an awkward four-petals flower shaped one. Kooky? Yes. But all in the name of good fun I guess. And different from the usual deep bowls routinely used in other establishments. Although not very space-efficient; given the rather restricted elbow space on the square tables. Forgot the real name of this, but a good Beer Snack from the light bites category; a Nachos with Melted Cheese and bacon bits. The last page and a half consist of Beer Snacks; various savoury bites to go with your choice of liquor. And while we are on the subject of alcohol, Secret Garden comes equipped with a wine cellar. Mr Lim, the proprietor of Secret Garden Hotel proudly proclaimed that they stock up on the finer imported wines, and with far-from-hefty price tags. Wine connoisseurs rejoice, for here comes another hotspot for you to exchange life stories, sip on fine liquor and have a jolly good time at their lounge. 4 Season (RM20.90/USD6.30) – A set of four types of sandwiches; Salmon with capers on toasted baguette, Salad sandwich of mixed greens stuffed in a pita pocket, English Sandwich with a squared sunny side up, and the Steak Sandwich between whole-grain bread. 4 Season is one of their forte; a set of sandwich selection to be shared amongst diners. Since we were sharing the breads, I only tasted the Salmon which was fresh; rendering almost no role for the dollop of mayonnaise. Squeeze some lemon juice over on the slices of raw salmon, and relish. The others seemed to be okay, but the Salad sandwich tucked in a pita bread was lacklustre; being rather dry without any dressing at all. 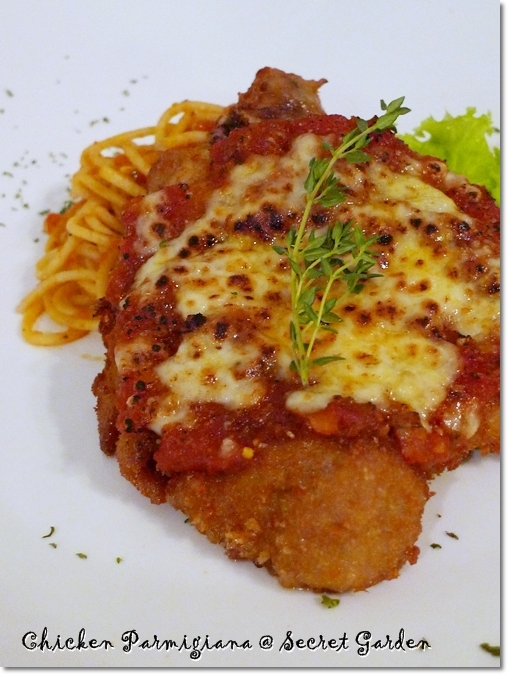 Chicken Parmigiana (~RM32/USD10) – A breaded fillet of chicken fried then baked with a sumptuous combination of cheese and a marinara sauce. Chicken Parmigiana was not on their menu yet, I believe. This was however, one of their Specials written on the board visible from the front door. The other being a Tuna Steak, or something along the line. Served with a side of spaghetti in marinara sauce (tomato-based sauce without meat) the chunky portion was filling and suits the average eater with a sizeable appetite. Of course, you can complement your meal with various light bites aforementioned, or even a Soup of the Day (usually Cream of Pumpkin at about RM8-RM10 each). 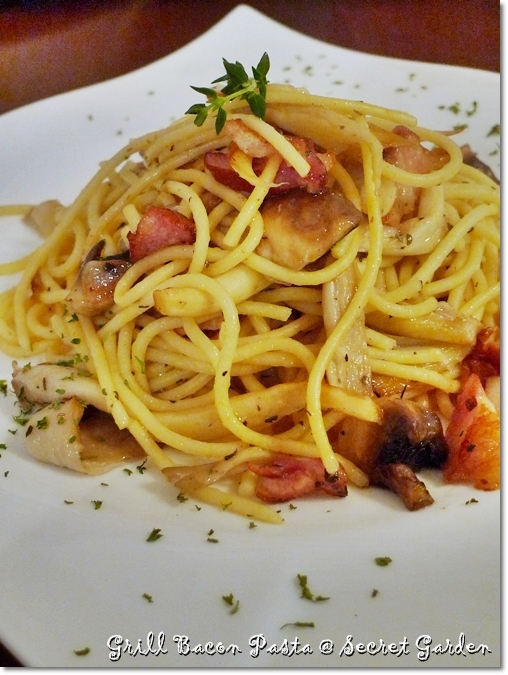 Grill Bacon Pasta (RM20.90/USD6.30) – Fried spaghetti with pan fried bacons and mushrooms. For their pasta selection; you can choose to have your Bolognese or Carbonara, or an interesting Hokkaido Fusion of raw ingredients topped with caviar (!). The Grill Bacon Pasta reminded me of Pasta House’s version of the Fried Pork Pasta, albeit with more ingredients. Combining the earthy abalone mushrooms and greasy pan fried bacons never faltered; and a perfect foil to the al dente pasta. Pastas are priced from RM18.90-RM20.90. Opulence, funky and quaint. 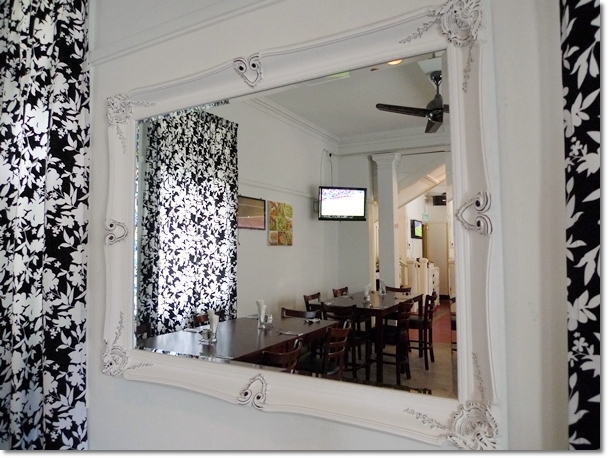 Don’t worry, the restaurant is fully equipped with air-conditioners; the fan is there to complement the atmosphere. Soon Secret Garden will be offering the Signature Breakfast all day long; or as Mr Lim himself proclaimed as the REAL American Breakfast with sausage, bacon, eggs, wild mushroom, tomatoes and a glass of fresh orange juice as well as a cup of black coffee. If you’re a fan of steaks, heave a sigh of relief as you can find Wagyu steaks (marbling grade of 5) imported from Australia here. About RM80/USD24 per 100g, have them charbroiled/grilled to your liking. The rack of lamb (~RM40/USD12) is another one of their famous item, as well as various grill platters and seafood combination. Oh you can also have a platter of various imported cheese and dried fruits to complement your wine, at RM28.90/USD8.80 per serving (excluding the wine, of course). A desolated refurbished bungalow in the middle of nowhere? More shots to come later on the second page of this post. 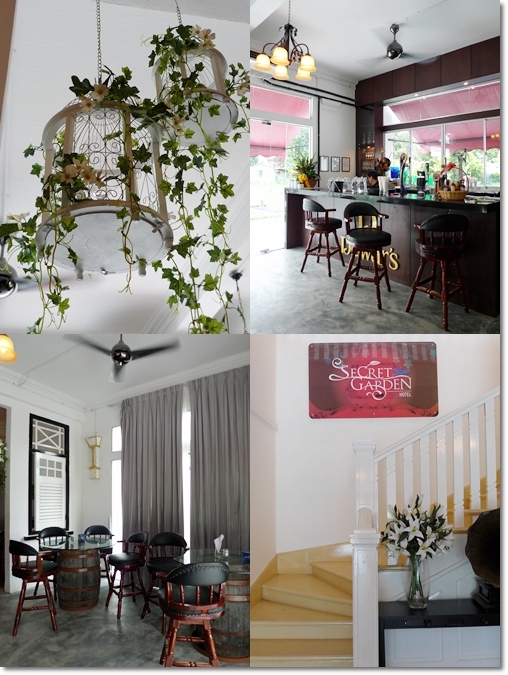 For now, just rejoice at the thought of another dining option in a most secluded area in Ipoh. I guess, the Secret Is Revealed Now? Business Hours : 4pm – 1am daily. From the last picture, I know why it is called the “Secret Garden”.. The restaurant really looks kinda cool =] Their food is looking very tasty too, how good if I can have the Chicken Parmigiana~ haha.. Tried Chicken Parmigiana..nothing to shout about…just another deep fried chicken tighs in thick breadcrumbs. Four Season too dry and common but charging RM20.90 is slightly over rated. Indeed, the Salad sandwich was a little bland and dry, but the Salmon with mayo and capers was okay. One thing of note here, the food at Secret Garden may get cold and hard really fast due to the blaring air-cond and fans. So it’ll be best to tuck in straight after being served. Well, totally agreed. The price is over rated, consider as a 5 stars price but NOT 5 stars service and 5 stars quality! If the management could put more efforts to improve , it will be a good running restaurant in Ipoh. I have been in gastronome for more than 25 years in Europe. 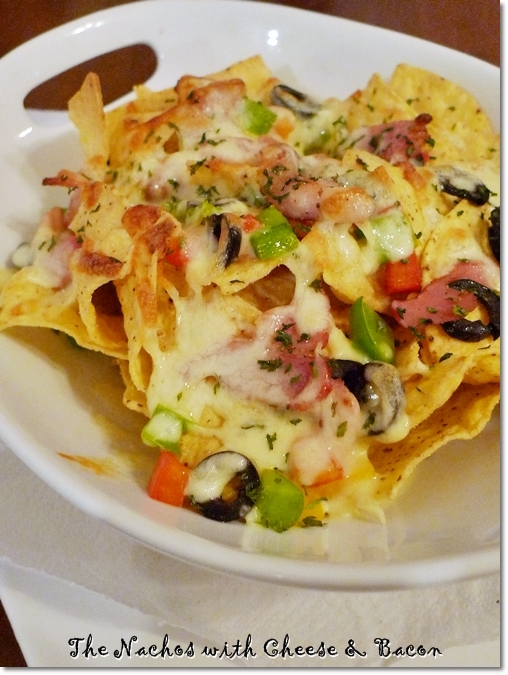 For a western food restaurant like this one is “no way” at all…..need to improve a lot a lot! My 2 cents! Thanks LLyw on that comment. Maybe something the management can look into? Secret Garden looks really nice and cozy. 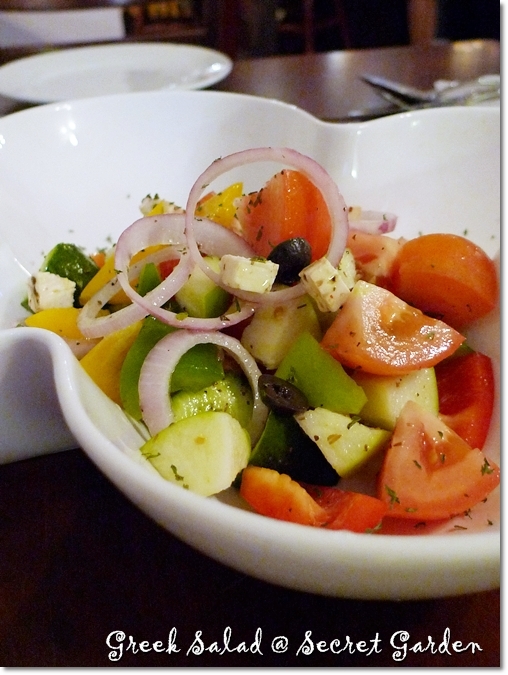 Love Greek Salad… must be pretty healthy! Been there yesterday nite… The food is really not up to standard at all… I think a lot of improvement need to be put into it otherwise it will be another cold room soon… Worst thing that can happen to a restaurant like this when I asked for dessert. They told me they are still too new so no dessert… What the #%%$? At least serve ice cream and cake.. Really a let down.. I can foresee this as another shop waiting to be close if thier forte is food.. Maybe if they are open more of the drink scene survival rate might be higher.. Rack of lamb, asked for medium well, came out overly done and the mint sauce that accompany it dish water..
Neway just my 2 cents.. Try with caution.. Thanks Yee for the feedback. Until now (we just went for dinner) they have yet to include a dessert in their repertoire. Mostly concentrating on mains and snacks to go with the alcoholic drinks. Maybe the management should take heed in this aspect? Wow, lucky for you that the Hokkaido Fusion you had was fresh. I have been purging for the past 32 hours and it doesn’t seem like it’s going to stop anytime soon. I really wished I have something nice to say about this restaurant, especially being an Ipohian with so much pride in our local food. I often refer to your blog when it comes to seeking out new food to try or if I had a restaurant in mind and you have the most comprehensive reviews most of the time. So on Saturday, I brought some outstation friends to celebrate my sister’s birthday at Secret Garden as it’s something new. I really loved the bungalow & garden concept, but when it comes to the food and service, I’m dissapointed to say that our night was a spiraling nightmare. We were a table of 6, and we ordered the Cheesy Nachos as appetizer, Lamb Shoulder, Hokkaido Fusion, Rib Eye, Ocean Seafood Platter and Honey Mustard Salmon. Before ordering our food, we posed some questions towards the waiter who was serving us. (The first one who came had no idea what the restaurant was serving so he had to ask for help *first blooper*). The second waiter was very polite and answered every question in a professional manner. We asked what the Ocean Seafood Platter consisted of, and he told us that it was FRESH salmon with prawns and a variety of seafood. He also recommended the Hokkaido Fusion, which had fresh salmon as well. Sounds great for sashimi lovers like us, so in our excitement, we ordered them. Unfortunately, the seafood platter appeared much different than what we expected. The plate consisted of a mountain of FRIED (dieters will scream in horror) seafood; Our friendly waiter tried to persuade us to accept the dish saying that they purposely cooked our food in fear that we cannot stomach raw food (he appeared to be right actually *purges*). At first we were slightly ‘impressed’ by the restaurants considerate gesture, until we scrutinized the quality of the ‘seafood’ which consisted of 4 crabsticks (the type we can buy frozen in supermarts for RM4.50 a pack of 48), 2 small prawns, 4 fillets of dory fish and common salad on the side. For RM32.90. We started arguing that they should have informed us at the beginning and let us have there was an option of having it cooked or fresh, not just depending on the restaurant’s discretion of their guests’ preference. My sister was very upset to be served something she had no intention of eating (plus it was her birthday) so we insisted that she be given the FRESH Ocean Seafood Platter. And then the truth came out; apparently the menu was changed (and the waiter didn’t know? *cough*) therefore the FRESH seafood was actually… not available. He could have just apologized and said it wasn’t available actually, offered us a change of order instead of coming up with such a questionable excuse to make us accept it, even though it might offend his boss to waste food. We decided that we preferred a healthier option and ordered another lamb shoulder in replacement of the seafood platter. I agree with CW, the chef had no discretion between rare, medium, medium well and well done (so it was a waste of time asking us when we ordered). From the looks of it, he has indeed mastered the skill of ‘overdone’ as our meats were dry and tough despite us requesting for medium. One of our lamb shoulders was even burnt black. I wouldn’t recommend the lamb as it is a unpleasant chewing experience. The mint sauce was diluted with vinegar and water. How did we tell, it’s because half the people in our table work in the F&B line. Majority of the comments about the food being too salty had a lot of basis. I’m not sure whether using oyster sauce as a marinade for a western lamb dish (and then dipping it into a dodgy mint sauce) a conventional way of eating it. The rib eye is NOT a rib eye. So don’t foolishly throw away your RM43.90 for it. It’s a piece of beef tenderized (beaten flat, which made the meat tighter) to look huge and was overly cooked despite the request for medium (due to the fact it was thin). I’m sorry to say this but a lot of steak lovers will be seriously offended if this continued. On another note, my mum got my uncle’s account of his experience today. He went to Secret Garden (hearing it was a replica of Indulgence) with a westerner friend and they both confirmed that the rib eye was NOT a rib eye. Their main meal came out when they were in the middle of their appetizer, and the waitress holding the main meal questioned them repeatedly, “Then how?”. I suppose if you’re in a common western restaurant, they could just put the plate there anyways and the guest can just switch plates once they’re done and the waitress can just collect the empty dish whenever she’s free. I don’t quite remember this rule in high class fine dining though. While I’m still at fine dining rules, I noticed that when we asked for ketchup, the waitress gave us a small sauce dish and the bottle of ketchup. Had she just gave us the bottle, the offense wouldn’t have been so severe. Normally, fine dining restaurants would readily pour out a small dish of ketchup and then serve it to you, not exactly giving you the bottle and dish to pour it out yourself. I wasn’t entirely bothered by this but when I struggled trying to pour the ketchup (short of using a knife to dig it out :P) my friend pointed it out to the waitress the proper way to do it after attempting to pour it himself (and still failed). The nachos meant as appetizer only came after we finished our main meals, even after us asking for the waitress to check on it 3 times. I don’t mean to be offensive and start up a controversy but in the end, after 32 hours of suffering, my stomach urged me to do it some justice by writing an honest and educational review. At it’s current food standards, I would recommend everyone to just continue eating at Ye Olde English for its value for money and consistency. Realistically, everyone will have different experiences (good/bad) when eating at certain places so I’m certainly not implying that any future visits to this restaurant will prove disastrous. Hopefully, the management will improve their service and food in the future. 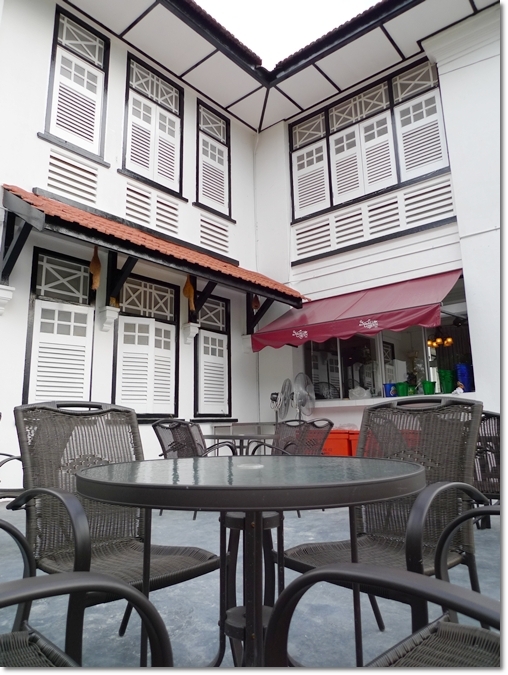 I like the idea of a boutique hotel in Ipoh. Will definitely chk it out one day. Thanks for the tip. Indulgence could possibly the first boutique hotel in Ipoh, with 7 rooms (if I’m not mistaken) decorated by Julie herself, and definitely worth a look. 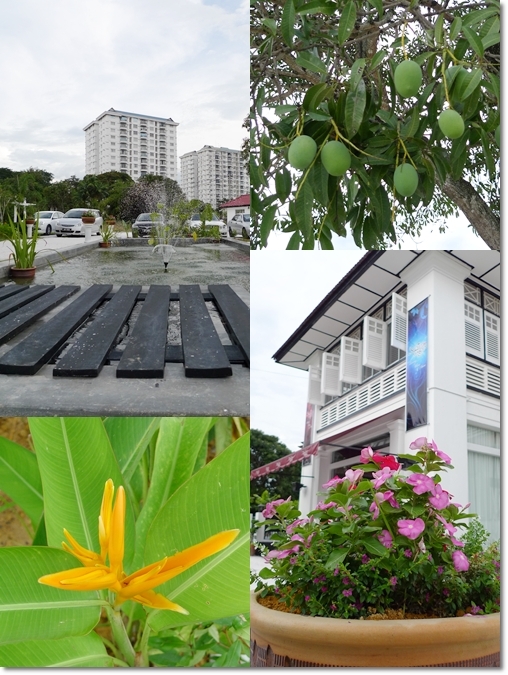 Paragon City Hotel near to Stadium Ipoh is another boutique hotel, but a budgeted option. Have not walked in and see for myself, hence no comment. Been in Paragon.. Don’t think it is a boutique hotel.. The rooms are small and the wall are make out of partition.. U can hear the people next door loud and clear.. It is more of a budget hotel.. I think a room cost RM60 a night..
Yeah, but they proudly proclaim as such, hence the moniker; Boutique Hotel used loosely? From RM69+ per night, I think. Kudos TallGal …. now you can instantly remember your Sipadan getaway with ease. The place looks really nice and cosy! But the prices are really on the steep side, even compared to KL standards. How would you fare this against Indulgence? Hi witch, truth be told, there’s this uncanny resemblance to Indulgence when I first visited. Not as opulent nor spacious, but more like a cozy spot to hang out for some drinks and such. Foodwise; can’t really compare head to head for I do not think they’re on the same level. So let’s not compare an apple to an orange? The rooms are not launched yet. Maybe few months down the line. i had grilled bacon pasta d other day when i went n it wasn’t really good..i agree with wat Tallgal said..it was very salty and it tasted something like fried spaghetti in cintan noodles’ seasoning…bacon also normal and mine didn’t come with mushroom like yours..grrr! !and it’s so over-priced..and not much of a choice when it comes to drinks..they’ll recommend u to take a bucket of beer as juices cost d same…sigh..
Fresh juices are priced at about RM9.90 each, hence it’s wiser to take the bucket? Anyway, during my second visit, they were having a Buy 3 Free 1 beer promotion. went there once for drinks with friends. had their snack – Lamb Cut. the lamb was cut into small pieces served on top of a plate of hash browns. the lamb was well marinated but the texture on the chewy side. kinda tiring on the mouth. haha…but i like the ambience though as u said it’s cold inside. Maybe should have told them to grill them until medium done? Yeah, it was a little chilly sitting under the fans, which made the food cool very fast. Was there few times for drinks.. They should filled up & level the compound with tar as on rainy days, can see puddles of water everywhere! Had a hard time walking to car as wearing heels mah! I WILL LOVE 2 TRY…. IS THE FOOD HALAL 4 MUSLIM ???? Hi ADIVA, sadly no. The place serves alcohol. Passed by ‘Secret Garden’ this morning. A little impressed by the name of the bistro,the design, decoration. But too much of bad cooments about it. Not dare to try. Hi, just been there a few days ago, well the service was good…. Guess with all the comments, the management is really looking into improving this place. Hopefully it stays as ipoh has very few good places to go to. Good to know this shallu. Ipoh’s actualy thriving to be the next BIG city; with a second and larger Jusco to be opened in Pengkalan, and many hotels and business centres in the works. FYI Banyan is a SPA this place in located next door…. nothing to shout about don’t bother checking out oops sorry for the remark!!! The food and soups were a little creamy and oily. So you will feel full very fast. Maybe they should reduce the fats a bit..
i love their prawn cracker…it’s delicious! just back from secret garden…food quality drop compared my last visit there, furthermore, i order orange apple juice they sent apple juice, after waiting for extra 20 min then told me forgot to put in order for the fish…. to some one who like ‘Beef’ ,you should try secret garden ‘Kilkenny Beef Stew’, It’s delicious. Actually, tis place is good for drinking beer…nice environment but not the food…..food not so nice, maybe steaks are ok…..well, service not bad too, friendly. One good thing is their happy hour or drinking session also available in afternoon. Air con also cold enough…thats good got beer drinkers….!!!! Yeah … environment is rather conducive. But would be better if they had a more spacious dining area indoors. Hi there. No, they’re not Halal. Only pork-free, I am afraid. Easy for us searching and get new menu. I like going spend my weekend on sunday, enjoy the Jazz Nite! Anybody like listen? First impression as I was driving in is rated as 7/10. But the impression quickly went south after what appears to be a Telephone booth but without the detailing of a pay public phone prop. What started out as an adventure, became more of a nightmare. 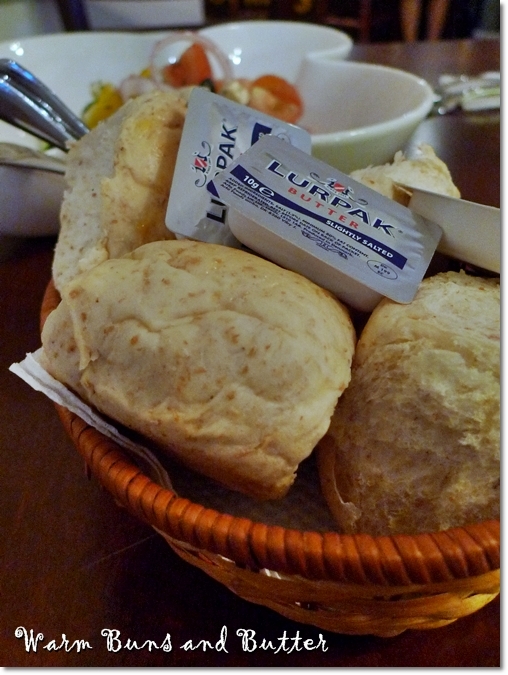 For starters, the bread rolls taste and look as leftover from the day before. Ordered the Lamb shank. What was I thinking. It was one of the worst lamb shank I’ve ever had. The meat was not even cooked to near perfection. Tough, sinewy and still very much attached to the bone. As for the sauce, it was bland and added pepper doesn’t do well enough to excite the palate. I agree with some of the suggestion prior, the chef needs to be replaced and quickly. My first time to this place was horrifying. It looks big from the outside, but when i entered the place was so noisy cos of the echos and the place as packed as the tables are arranged about one feet away from one another. No privacy, noisy, cramp, waiters did not know what the dishes were when asked and they cannot understand what I wanted. Not a place i would recommend to anyone, Period. Don’t waste your time in this restaurant. There is nothing to shout about. Neither the atmosphere nor the food is recommended. i went there few days ago .for me ,i can tolerate with slow(took more than 1hour ) &bad service (didn’t serve all coffee in one time &is juz 5cups )&need several request .i cant accept they use ceramic tiles to serve the food .the plates are expensive, but tiles are not produce to put the food, it might contain hazardous materials .it doesn’t show creativity, but lack of sense. anything completely, except this piece of writing offers good understanding yet. of Ipoh City | Motormouth From Ipoh – Malaysian Food & Travel. by brain dead individuals? 😛 And, if you are posting on other sites, I would like to follow everything new you have to post. the spelling on several of your posts. Several of them are rife with spelling issues and I to find it very bothersome to inform the reality then again I’ll definitely come again again. I am actually glad to read this web site posts which carries plenty of valuable facts, thanks for providing these kinds of information. I used to be suggested this web site via my cousin. I am now not sure whether this submit is written via him as no one else recognize such distinct about my trouble. Do you’ve any? Please permit me realize in order that I may subscribe. Thanks. Good ambience but overrated with the so so food. I’d rather spend that amount of money for lunch in the limestone. I will right away grasp your rss as I can’t find your e-mail subscription hyperlink or e-newsletter service. Do you’ve any? Kindly let me recognise so that I could subscribe. Thanks.